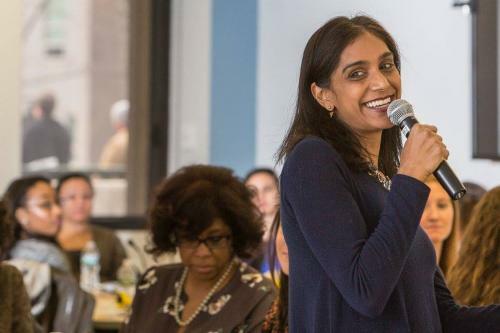 Asha Rangappa, Associate Dean of Admissions and Financial Aid at Yale Law School, presented “Your Personal Board of Directors: How to Maximize Your Mentors” on Tuesday, January 12. The engaging session was open to participants in the formal mentorship programs organized by Future Leaders of Yale and Working Women’s Network. Asha challenged the perception that mentorship should be one-on-one. It is important, she advised, to have several mentors to leverage us through life. Mentors don’t have to be bosses or superiors. They don’t have to be of the same gender or in the same professional field. A board of directors, Asha defined, is a group of people who have our best interests at stake. Colleagues, friends, or family–our naturally existing and evolving support network–can be on our board. An advantage in having more than one mentor is getting different perspectives. (Plus, it takes the pressure off our one mentor.) The more data we have the more informed we are to make decisions to grow personally and professionally. There’s truth to strength in numbers. To read more about mentorship, see FLY’s Mentorship page. Use the self-directed mentoring program to build your own board of directors. You may find you you’ve had a board all along!